Poet and educator Bruce Meyer will read from Portraits of Canadian Writers and 1967: Centennial Year on Tuesday, Oct. 24 at 7 p.m. in the Ganong Hall Lecture Theatre. In Portraits of Canadian Writers, Dr. Meyer shares the portraits of some of Canada’s most beloved writers alongside anecdotes that reveal their personalities. Margaret Atwood, Leonard Cohen, Ray Robertson, Bronwen Wallace – these are just a few authors whose unforgettable words have made them icons of Canadian literary expression. 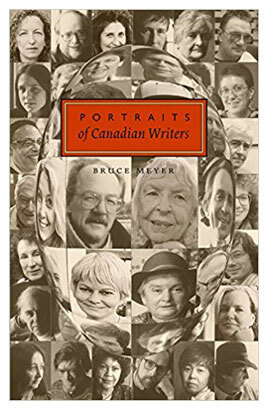 In Portraits of Canadian Writers, Dr. Meyer presents his own personal experience of these and many more seminal Canadian authors, sharing their portraits alongside amusing anecdotes that reveal personality, creativity, and humour. Dr. Meyer’s snapshots, both visual and textual, capture tantalizing glimpses into the creative lives of writers, from contextual information of place and time to more intangible details that reveal persona, personality and sources of imaginative inspiration. Through these portraits, Dr. Meyer has amassed a visual archive of CanLit that illustrates and celebrates an unparalleled generation of Canadian authorship.